A man walks through a greenhouse in northeastern Uganda where sustainable agriculture techniques such as drought-resistant crops and tree planting are taught, Oct. 19, 2017. World hunger has risen for a third consecutive year, according to the United Nations’ annual food security report. The total number of people who face chronic food deprivation has increased by 15 million since 2016. Some 821 million people now face food insecurity, raising numbers to the same level as almost a decade ago. The situation is worsening in South America, Central Asia and most regions of Africa, the report shows. It also spotlights a troubling rise in anemia among women of reproductive age. One in 3 women worldwide are affected, with health and developmental consequences for them and their children. From 2005 to 2014, global undernourishment was on the decline. But the rate of decline continuously eroded, like a car moving forward at an ever-decreasing speed. Several years ago it stopped altogether, and world hunger started to climb once more. Among the factors driving this reversal was climate change. While malnutrition and food insecurity begin at the household level, hunger is everyone’s business. The damage wrought by hunger on communities can provoke regional instability and conflict that can extend beyond impacted areas. For example, drought and crop failures in Central America are among the drivers of immigration across the U.S. border. The causes of food insecurity are complex and interrelated. In our recent book, “How to Feed the World,” a collection of essays from leading researchers, we review pressing challenges. Among them, climate change emerges as a troubling problem that influences all others. Earth’s climate has swung into and out of ice ages since the dawn of time. In the last 50 years, however, things have changed. Average global temperatures have increased ever more quickly, with new recorded highs in 2014, then again in 2015, and again in 2016. Climate change is also increasing the severity and frequency of extreme weather events, such as powerful storms and droughts. As a result, some regions of the world are getting wetter, including the northern United States and Canada, while others are becoming drier, such as the southwestern United States. In the U.S. Midwest, heavy rainfalls events increased by over a third from 1958 to 2012. Crop damage on Puerto Rico from Hurricane Maria, Oct. 3, 2017. Producing enough food for everyone in the world depends heavily on climate. This means that it will be impossible to curb hunger without preparing for and adapting to climate change. Climate change renders generational and historical information about farming less valuable. What worked before may no longer apply in an altered climate. When historical knowledge no longer works, farmers must rely on other sources of information, such as meteorologists, agronomists and other scientists, as well as the development of new sustainable technologies. Farmers in the most advanced economies, including the United States, already rely heavily on scientific knowledge, which is often mediated by the private sector or by local extension services. However, farmers in the poorest countries – which in many cases will suffer the most severe impacts from climate change – rarely have access to such knowledge. Even in wealthy countries, these adjustments are costly. And public funding for agricultural research and development has been declining for a decade in the United States. The poorest countries in the world account for just 3 percent of global spending on agricultural research. Without investments into sharing research discoveries, many advances in wealthier countries will not be transferred to low-income nations. North Carolina farmers reckon with crop losses from Hurricane Florence in September 2018. Climate change also intensifies other stresses on global food production. Consider the critical role of water. Meat consumption alone accounts for an estimated 22 percent of global water use, and this need will increase in a hotter world. Climate change also alters rainfall patterns: Some places will have too little water to farm, while others may have enough but find that it falls at the wrong time, or arrives less frequently but in larger rainfall events. Even seemingly disparate factors like international trade are affected by climate change, with serious ramifications for food security. As climate change drives permanent shifts in the geography of world agricultural production zones, international trade will emerge as an important resiliency mechanism for reducing hunger and for enhancing equal access to food. For instance, a 2012 heat wave and drought prompted major losses in corn harvests in the United States. Producers in the Southern Hemisphere adjusted to the shortfall, which served to moderate price increases in the United States. This was only possible because of international trade. 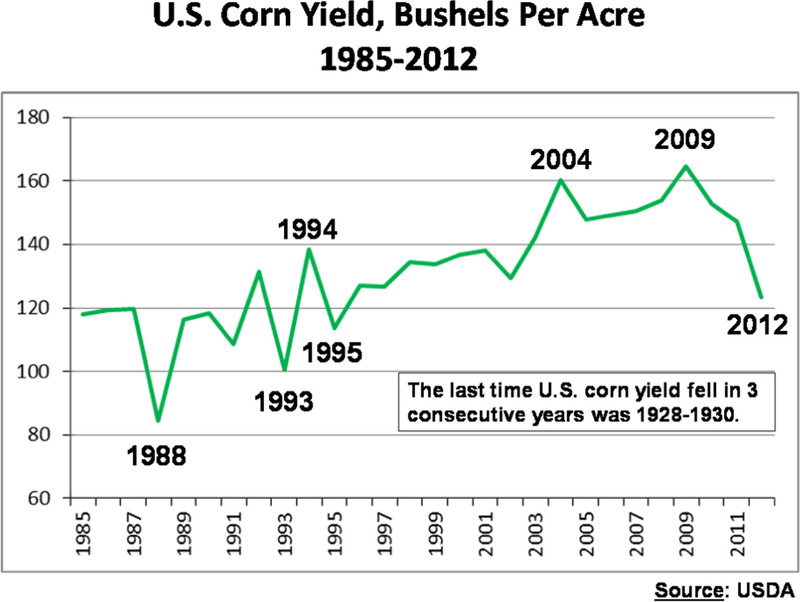 Widespread drought caused heavy losses for U.S. corn farmers in 2012. An effective response to climate change will also be critical to making progress on a host of other food security challenges, such as curbing food loss, improving nutrition and promoting sustainable production systems. Food-producing nations will need creative policies and new technologies to meet these challenges successfully. Climate change is anticipated to force more than 100 million people into extreme poverty by 2030. Adapting to climate change is a key way to combat this – and technology can help. For instance, precision agriculture can leverage computers, global positioning systems, geographic information systems and sensors to provide the data necessary to give each tiny parcel of land on a field exactly the inputs it needs. And a resurgent interest is occurring in use of the time-honored technology of cover crops to mitigate climate change impacts. We can go even smaller in our measurements with the emergence of nanotechnology. Aside from making field sensors smaller and more compact, nanotechnologies can also help improve how fertilizers and pesticides are released. By putting chemical inputs into tiny capsules or in gels, it is possible to control when and how these inputs are released to make them more effective, and at the same time reduce chemical emissions and runoff. But ultimately, it is up to individuals. Around the world, people must wield their social power to encourage mitigation of climate change and promote investments in technologies for adaptation. We need everyone at the table contributing to a food-secure future.